With the goal of achieving practical and functional hybrid rocket propulsion systems, ORBITEC has patented a unique hybrid propulsion technology called the vortex hybrid rocket engine. Rather than injecting oxidizer parallel to the fuel port at the head-end, as in a classic hybrid, oxidizer is injected tangentially through a swirl ring at the aft-end of the fuel grain. This injection method generates a bidirectional, co-axial vortex flowfield in the combustor. The swirling, high-velocity gas enhances heat transfer to the fuel surface which, in turn, drives high solid-fuel regression rates. Testing has already demonstrated regression rates up to 650% faster than a classical hybrid for a given mass flux. The rapid regression rate allows the use of a single cylindrical grain port which offers significant benefits including (1) increased volumetric grain loading; (2) simplified grain manufacture, and (3)reduced grain sliver at engine burnout. Additionally, the unique flowfield enhances mixing and increases combustion efficiency. • a large design, experimental, and analytical database. To appreciate these features, one must understand conventional hybrid engines. In the classical hybrid engine the fuel and oxidizer are physically separate and stored in different phases. Classic hybrid rocket engines have several important operational and safety advantages over both liquid-propellant and solid-propellant rocket engines. Unlike solid-propellant grains, solid-fuel grains are inert, insensitive to cracks and imperfections, and safe to manufacture, transport, store, and handle. Like liquid-propellant engines, hybrid engines can be throttled, but require only half the feed system hardware. Due to their relatively simple design and inherent safety, classic hybrid engines should display lower manufacture and launch costs than current propulsion systems. However, current classical hybrid engines suffer from low solid-fuel regression rates, low volumetric loading, and relatively low combustion efficiency. Common solid fuels, such as hydroxyl-terminated polybutadiene (HTPB), usually regress quite slowly compared with solid propellants. Complex cross-sectional geometries with large burning surface areas must be employed to obtain the necessary fuel flow rate consistent with the desired thrust level. Such grains require large cases and display poor volumetric loading and high manufacturing costs. The fuel may occupy as little as 50% of the total grain case volume. As the grain webs thin down near the end of burn, they are prone to release fuel chunks which results in sharp thrust pulses. The combustion of fuel and oxidizer in a classic hybrid occurs in a boundary-layer flame zone, distributed along the length of the combustion chamber above the fuel surface. 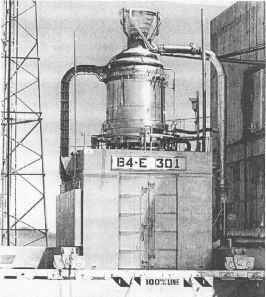 Portions of the propellants may pass through the chamber without reacting. Secondary combustion chambers at the end of the fuel grain are often employed to complete propellant mixing and increase combustion efficiency. These chambers add length and mass to any conventional design, and may serve as a potential source of combustion instability. These drawbacks are avoided in the VHRE. The vortex hybrid propulsion system has the potential to mature into a significant size range of propulsion systems. The systems would be suited for applications ranging from zero-stage strap-on boosters, to pump-fed, large, reusable first-stage boosters and second-stage sustainer engines for highly reusable launch vehicles. The vortex hybrid is also efficient in smaller sizes, and should find applications as propulsion for orbit transfer stages, orbital maneuvering systems for space vehicle propulsion. Crew Exploration Vehicle (CEV) capsule escape propulsion, and for orbit insertion kick stages. Additionally, the vortex hybrid has the potential to serve as an in-space refuelable propulsion system. Such a system would be re-fueled in space by fuel grain cartridges and pre-packaged liquid-oxidizer tanks launched for the purpose, and continue to serve for extended periods from a parking orbit in space. ORBITEC is currently evaluating the use of vortex hybrid upper-stage propulsion for satellite and booster applications. Another family of applications concerns a vortex hybrid that would make use of in situ resources from a lunar or Martian base. In more advanced future systems, propellant supplies could be delivered from lunar resources at lower energy due to the weaker gravity well of the Moon. For example, it may be feasible to produce metallic fuel grains of aluminum to burn with oxygen extracted from oxides present in lunar regoliths.